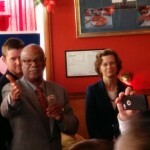 Michelle Nunn, our party’s candidate for U.S. Senate, stopped by Deorio’s Pizza, and MCDP turned up to welcome and support her! Thank you, Michelle! All photos and video by Harry Underwood. 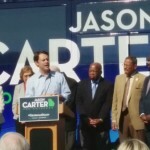 Join Jimmy Carter in Columbus! 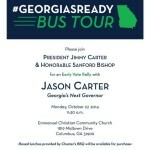 Please join President Jimmy Carter and Representative Sanford D. Bishop, Jr., together with the next Governor of Georgia, Jason Carter, tomorrow at 11:30 a.m. for an early vote rally right here in Columbus, Georgia, at Emmanuel Christian Community Church. Really David Perdue? Proud of Outsourcing?